outreach | Why a librarian? 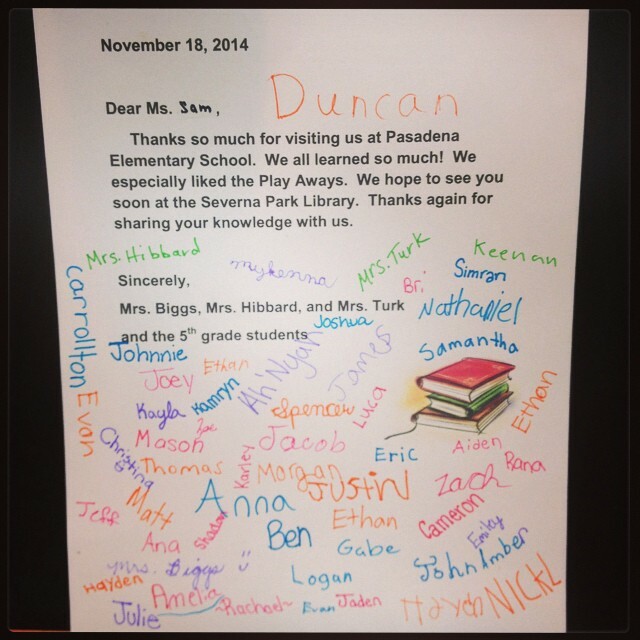 The little things: a thank you note from my outreach last week! I have been making the rounds, trying to visit as many of the local 5th grade classrooms as I can to talk about the different resources the library has to offer. Upper elementary school and early middle school is a tricky time for students. They are starting to get actual research projects but the books published on the subjects they are looking into tend to be too kidly or too mature. This is the time to introduce them to databases because the physical book resources are very limited. Anyway, this is what I focus on when I visit the classrooms. I ask the teachers in advance about what projects are on the horizon and use that as my example search. Using an assignment they are currently working on keeps it relevant and will hold their interest versus just doing through the databases and having them imagine homework (because no one fantasizes about homework). After you go over the basics of database searching, start moving into fun stuff. I’ve found the students are really intrigued by the learn a language databases, such as Muzzy. I also go over our other online services like live chat tutoring and chat reference. Then it’s time for the fun stuff! eBooks! Downloadable Audiobooks! And Playaways! These really get their attention and this is where the questions will start coming in. You can use any of these items to also demonstrate a basic catalog search and explain the process of placing holds. Try to make sure you have handouts for as many things as possible. They are only in fifth grade so not the best at note-taking just yet, so having how-to-find guides for them and their teachers take the stress off of them and you when it comes to remembering all the steps. Above all, be energetic and have fun. The kids will respond to your energy and excitement. I had 55 kids in my last group and they were full of great questions. And as a bonus, two of them have already visited me at the library! And one of them brought the entire family to get library cards. Talk about results! There have been some wonderful unintended consequences to wearing these buttons! 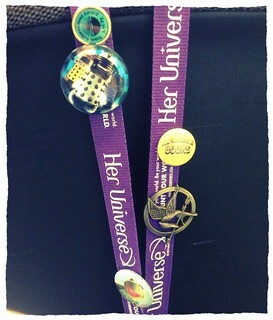 I wish I could tell you how many kids and teens ask me “Is that a Dalek pin?” while I’m helping them find a book. I’ve lost count. But it gives me a great way to break the ice with them and show them that librarians are people too, and we enjoy some of the same things they do. Talking to a teen about Doctor Who one day can make them feel comfortable approaching you for help on another day. I also have an R2-D2 (a good way to show street cred to prove to the kids that you really are a Star Wars fan and not an adult pretending to “get it”), and my Greendale College lanyard (which I have retired for awhile because it was starting to get a little bit icky) was another fun one. I had many people ask where Greendale was but I had a few sly “Human Beings” who called me out on it. I know it may sound silly – of course librarians are people too – but these little things can make you more approachable, take away that aura of “stuffiness” that seems to come with being a Librarian, and also make great conversation starters. So, this Saturday, I get to attend the local Comic-Con as a representative of the library! I’m actually pretty excited. Not only will I be paid to attend a convention, these are my people! I can’t wait to share information about the library with them. I feel like this is a group, probably tech savvy, who might not know about the different services we offer for free. And I’m not just talking about the free comic books (which we have) or the fact that we take part in events like Star Wars Reads Day – I’m talking about the plethora of digital services they could access from home, without having to step foot into a library (well, maybe once to get the card). We are even listed on the guests page, which just cracks me up!